Congratulations to Kiwanis Club of Greater Woodbury Past President George Wagoner on receiving the 2019 Robert H Weir Award from the ARC Gloucester. 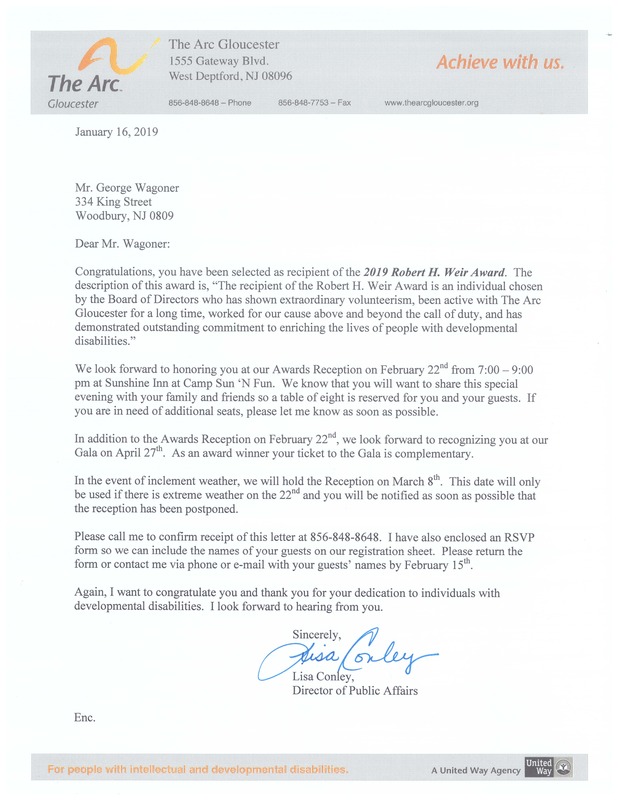 Well deserved honor for his many years of dedicated volunteering for this very special organization. area, Kiwanis member Newt Weiss a survivor of the Battle of the Bulge in WWII asks a question. SFC Louque, the Army Recruiter in the Woodbury office looks on. Col Croot addressed the club about changes in the recruiting strategy for meeting the Armys needs for a technology ladden battlefield of the future. It was clear that this is not your grandfathers army. He laid out a very compelling argument for the benefits of military service to possible recruits and how the highly selective recruiting critera yields only an acceptance of 3 for each 10 applicants. 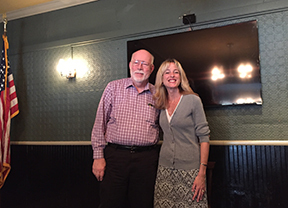 Jennifer Williams of Covenant House New Jersey, spoke to our Club on January 28, 2016. Shown below with President Jim Meehan, Ms. Williams told us the mission of Covenant House and how they help homeless young adults get off the streets and on a path to a more positive future. 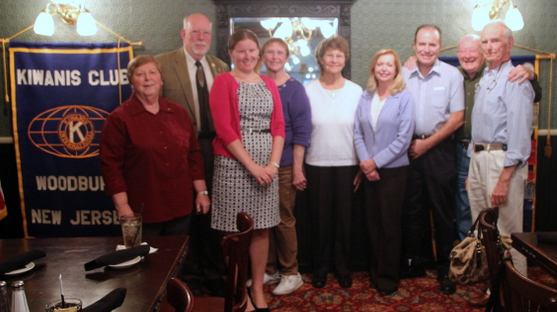 attend a dinner with Kiwanis International President Gunter Gasser from Austria. 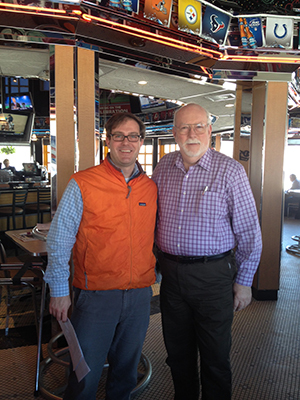 Kevin Kavanaugh, Vice President of RPM Developent Group, spoke to the Kiwanis Club of Greater Woodbury on January 30, 2014. RPM is the developer of the GG Green Building in downtown Woodbury. They transformed a boarded up run down facility into one of the premier spots in the city. our 90th year Charter together at Tavistock Country Club on October 25, 2013. Everyone loves to get products and services at a discount, especially when you can contribute to community service at the same time. The Kiwanis Club of Greater Woodbury is partnering with Entertainment Books to offer deals both locally and all across the country. 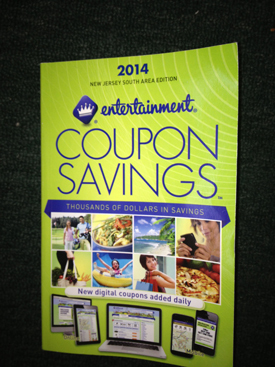 No longer limited to just hard-copy coupons, a book purchase enables smart phone users to put an application on their phones to get electronic coupons sorted by proximity to the user’s location as well as type of deal sought. Thus, purchase of a South Jersey (or any other area) book enables the owner to take advantage electronically of offers in other areas across the country as well. Deals include travel-related services such as rental cars, airline tickets, cruises and hotels as well as fine dining, casual restaurants, retail products and services. Even the books are discounted this year for only $25 per book, which offers potential deals that could save the owner hundreds of dollars or even more. 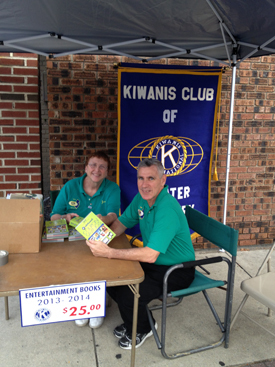 These books make great gifts and can be ordered for many cities around the country from the Woodbury Kiwanis. Local area books (South Jersey and Philadelphia) are available from any Woodbury Kiwanian, or by calling Jim at 703-237-2715. Orders for the 2014 book for other cities (usable immediately) may be placed at any time before the end of November. The effort is part of the Kiwanis annual fund raising program to support a variety of youth and community programs in our area; information about the specific programs is available at www.kiwaniswoodburynj.com. Rich Stahler, Immediate Past President; Tony Currier, Treasurer; Ed Barry, Board Member. the Kiwanis Hixon Award. She is joined by past Hixon Award winners. Betty Limanni, Howard Ballinger Jr., George Wagoner and Ed Barry. Jim Kelleher, Jane Moffet and Kathleen O'Connor. 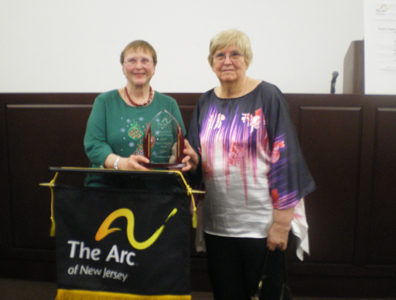 Joan Van Note and Amelia Kressler, advisors of the new Aktion Club of Gloucester County, accepted the Spirit of Arc Award for the Greater Woodbury Kiwanis Club on December 10, 2012. 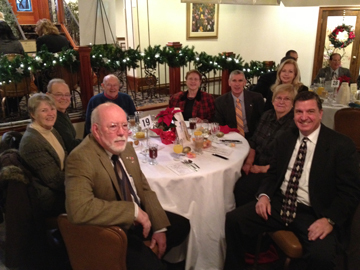 Kiwanis members join about 300 others at the 2012 YMCA Mayor's Prayer Breakfast December 5, 2012. 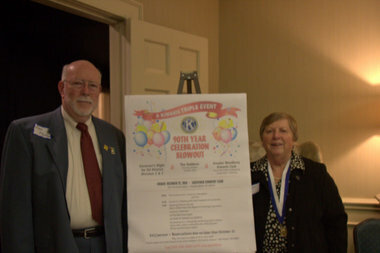 On July 12, 2012 at Scotland Run Park, the Kiwanis Club of Greater Woodbury helped the Kiwanis AKtion Club of Gloucester County celebrate their Charter night. The club was formed by the tireless efforts of members of the Kiwanis Club of Greater Woodbury, the Arc Gloucester and thanks to the financial grant provided by Wal-Mart. 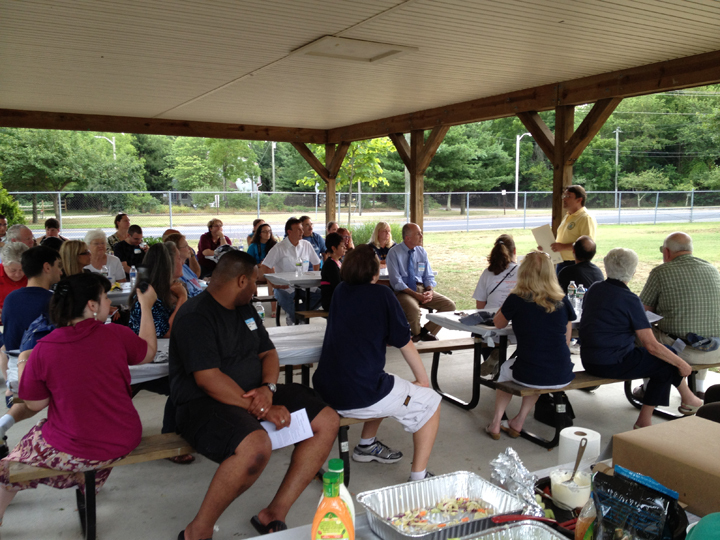 Photo below shows Freeholder Larry Wallace, the evening's Keynote speaker, speaking to the gathered crowd. Wallace also presented AKtion Club President Dorian Davis with a Freeholder Proclamation. 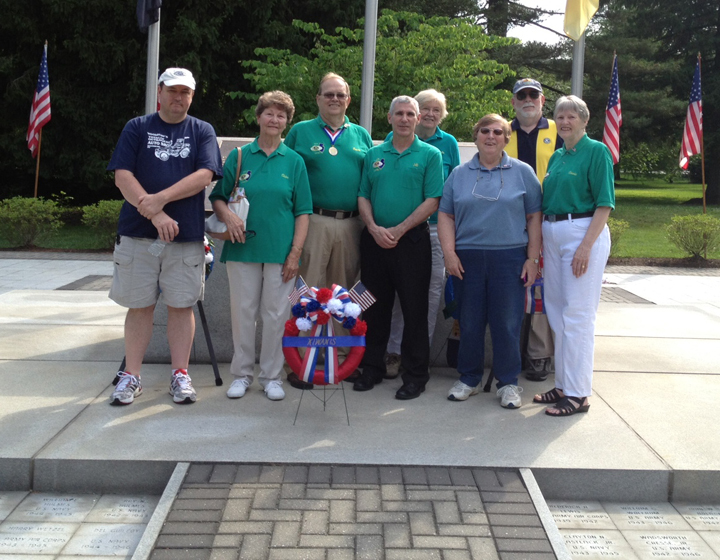 Members of the Kiwanis Club of Woodbury laid a wreath at Memorial Day Ceremonies at the WWII Memorial Site in Woodbury on May 28, 2012. The Volunteer Center of Gloucester County held their 1st Annual "Spirit of Community" celebration on October 27, 2011 at Masso Caterers in Glassboro. 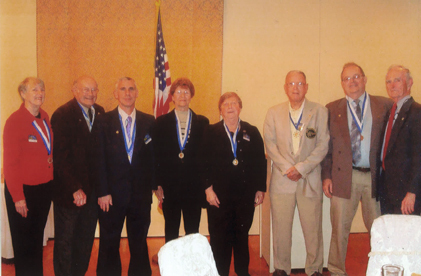 Our Greater Woodbury Club was privileged to have Claire Essig, Betty Limanni, Jeff Morris, Joan Van Note, Connie and George Wagoner receive the President's Lifetime Volunteer Service Award for service to their communities. They were presented certificates signed by President Obama, Senate President Steve Sweeney, Congressman Rob Andrews and others. 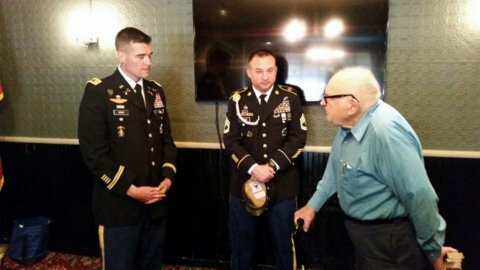 Congratulations to all and thank you for your service. THANK YOU to all who helped with the Woodbury Community Cocktail Party on June 8, 2011. Proceeds benefited the opening of a Woodbury Unit of the Boys & Girls Clubs of Gloucester County. The event was supported by 150 business and community leaders from throughout the greater Woodbury region. John Michael Paz, founder of Godwin Pumps, was honored as Boys & Girls Clubs Citizen of the Year. Copyright 2010-2019 Kiwanis Club of Woodbury New Jersey, Inc.
Site design and hosting compliments of Morris Graphics Inc.